DiceMaster allows players to roll with more complex rpg dice than the game provides, use a custom health and resource bar to track unique combat systems, and design a set of character-specific traits. *You can click and drag this frame to move it around your UI. You can also left-click the minimap icon to show/hide this panel. Edit this field to set your custom dice using the XDY+Z notation, where X (optional) represents the number of dice, Y (required) represents the number of sides, and Z (optional) is a positive or negative modifier. 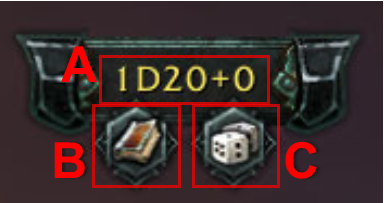 Default value is 1D20+0. Click to open your Trait Editor frame. Rolls with custom rpg dice using the data from the Custom Dice Field and prints the result in chat. If you are in a party or a raid, it will print the result for your group members as well. *You can click and drag this frame to move it around your UI. Your character's in-game name displays here. If you have a Mary Sue Protocol addon enabled (such as MyRoleplay, Total RP 3, or XRP), it will use that name instead. Closes the Trait Editor frame. All edits made to traits are auto-saved so you can close the frame at any time without losing your changes. All four of your character traits (and your Command Trait) are shown across this bar. You can click on any of the traits to edit them in the fields below. You can also shift-click any of these icons to insert a link for this trait into chat. Only players with DiceMaster will be able to use these links. Click to open the Icon Selector menu, containing a scrolling library of thousands of icons (including some from other games like Heroes of the Storm and Diablo 3) you can use to represent your custom trait. Edit this field to give your trait a custom name. Try to avoid exceptionally long names and remember to use proper capitalization. Left/Right-Click to toggle through a list of usages (Passive, 1 Use, 2 Uses, 3 Uses, etc). If you have your Charges bar enabled, you can also use a custom resource requirement (1 Charge, 2 Charges, 3 Charges, etc). Edit this field to give a brief, concise description of your trait. Try to be very clear and specific about the functionality of your trait to avoid confusion. Be mindful that any extra line breaks will appear in your trait's tool tip.Certain terms in your trait's description will be colorized in the trait's tool tip (e.g. "Double or Nothing", "Sense Magic", etc). Dice values in the format of DX and modifiers proceeded by a +/- will also be colorized accordingly. *Both of these frames can be moved around your UI by dragging the hidden grey anchor point beneath the center of each frame. Represents the number of Charges you have. You can left/right-click this bar to add/remove Charges. This bar will only appear if you have enabled Charges in the addon configuration menu. Steelgrasp Brigade events will utilize five Charges as resources to spend on abilities. Represents the character's health, up to a potential maximum of 10. You can left/right-click this bar to add/remove health. You can also hold down shift while clicking this bar to add/remove maximum health. Steelgrasp Brigade events, everyone starts with 10 health. Represents the number of Charges your target has. This bar will only appear if your target has enabled Charges. Represents the target's health, up to a potential maximum of 10. Represents your target's custom traits. 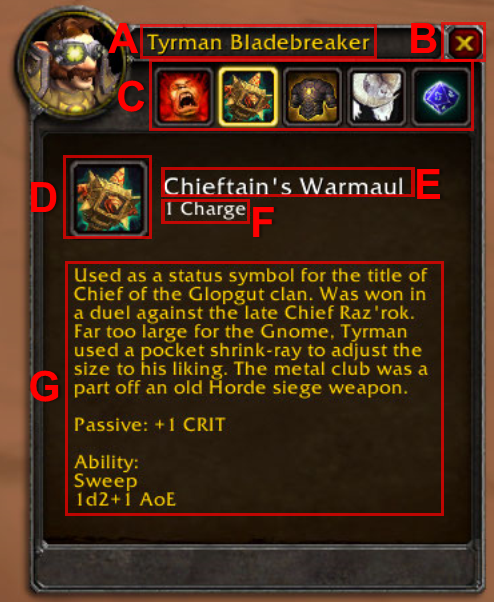 You can highlight any of these icons with your cursor to display a tool tip for each of these traits. "It's not the size of the Warrior in the fight, its the size of the fight in the Warrior."